New York has been supportive of solar power for some time, thanks to residents and the government expressing their belief that it’s a solid source for alternative energy. There’s also the fact that current electricity rates in the state are way high, which puts pressure on consumers to look for ways to save money. Fortunately, New York solar panel installers are available to help save you money and help you be more energy independent. 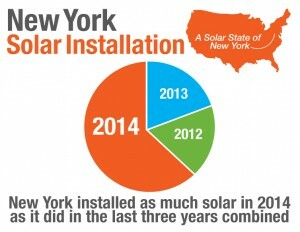 Thanks to the Renewable Portfolio Standard (RPS) quite a few people are investing in New York solar panels. RPS basically requires utility companies topromote the use of solar energy, which creates a great opportunity for you. In fact, the state’s original estimates for how many homeowners would get on board was exceeded, showing just how popular the program has become. Through the program, utility companies are being forced to give you a benefit for using renewable energy. And it’s because of RPS that homeowners have a great incentive to start generating their own electricity, because it’s bringing down the New York solar power cost. When the New York RPS program first launched in 2005, the original renewable energies target was 25% by 2013. Later, that goal was expanded to 30%. The state says that 20.7% of that number will come from renewable energy facilities, while 1% will come from the voluntary sale of green power. The rest of the renewable energy will come from new resources that will be gathered by the New York State Energy Research and Development Authority. About 9% of that portion has been set aside for solar energy systems at consumes’ houses. Originally, the state had set that number at 2%, but the amount was increased as it saw that people want to create their own electricity using New York solar panels. 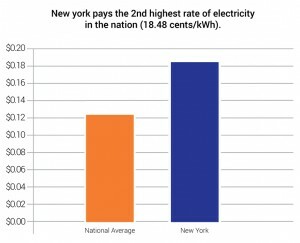 Electricity is expensive in the Empire State! 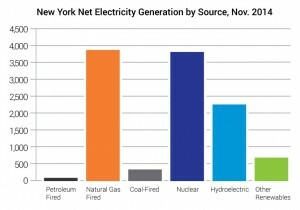 While the national average price for a kilowatt of electricity is just about $0.13, in New York it’s $0.21. It’s no wonder that people living in the state are trying to find every way possible to reduce their utility bill. People always want to save large amounts of money, which would let them pay off debt sooner, get ready for retirement, and reach other worthwhile financial goals. Homeowners can reach those dreams by leveraging the New York solar system cost and reaping the savings that come from going green. Remember that the high price of electricity means that using renewable energy will save you even more. To find out the details of just how much you can save each month, talk to one of our highly qualified professional solar installers today. So many homeowners put off buying solar panels because they think they need to have the money for it upfront. Believe it or not, leasing a solar power system can help you save more money, giving a return on your investment you’d miss out on otherwise. With 0 money down you can get a solar power system for your house, which is an affordable and great way to start saving money now. When you first finance your solar system it might cost more, but the savings start adding up each month, making it worth doing. Sometimes a financed solar power system pays for itself from day one, making it an even better investment. Considering how quickly electricity prices are rising, it won’t take too long for your loan’s fixed interest rate to be surpassed by the frequent utility rate increases in New York. Customers see the savings roll in within three years by financing solar panels. Everybody complains about the cost of utilities, but you can actually do something about it. When you install a solar power system on your house, you drive down the cost of your utilities. Not only are you using less electricity from the grid, you’re raking in other benefits from the government. Anyone who’s a resident of New York can take advantage of the NY-Sun PV Incentive Program. It’s a great way to save money, since the government gives out around $500 to $1,000 per kilowatt on solar power systems, with a cap of 25 kilowatts. The specific rates do vary by location, which is why you should consult with one of our professional installers. What this means is that even in a conservative situation, you could get a $2,500 rebate for a 5 kilowatt system, which isn’t half bad! Of course, these incentives aren’t going to last forever, so hurry up and get your solar system now before they go away. The State of New York is serious about giving you savings when it comes to installing solar panels on your house. You stand to benefit from a big tax credit, which is 25% of the cost of the installation. We can walk you through filing for the credit, making the process incredibly simple. The total tax credit you can claim is $5,000 which would only apply if you spend $25,000 to install it. The federal government also gives you a tax credit for using solar power, which is set at 30%. For this rebate, you have to calculate expense after any rebates, only adding to the money you save when you go solar. Double dipping is great! Thanks to the Empire State’s legislature, residents have even more great reasons to have a solar power system installed on their home. When a homeowner installs a solar system, the entire setup is exempt from property taxes for an entire fifteen years! It’s a great deal, because you’re adding to your home’s value, but you don’t have to pay the government for it. 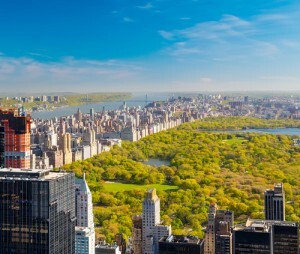 Is it worth investing in residential solar energy in New York? A lot of people in New York are wondering if it’s worth getting a residential solar energy system for their home. While everyone’s situation is different, usually a solar system is a solid investment. Depending on your solar PV system quotes, you might see money from your solar panels immediately. Our solar installers are experts on assessing your unique situation and helping you understand exactly what you can gain. Usually a lease for a solar power system lasts about 20 years, but you might not qualify for some of the same tax credits, rebates, or incentives you benefit from when you buy the system. Another drawback is the fact that you can’t depreciate the solar system when doing your taxes. There are some good things about financing versus outright buying. You can save up to 50 percent each month on your utility bill, depending on factors such as your household’s usage and different physical characteristics of your home. When you lease a solar system, you’re only paying for the equipment and whatever electricity you buying from the utility company. With some lease agreements, you don’t have to worry about maintaining or repairing the panels, which can be a solid benefit. One of the most important points is that often you can get into a solar lease while putting zero money down. When the end of the term rolls around, you can decide if you want to purchase the panels. You do need to have excellent credit if you want to get a solar lease. The reasons to get some solar PV system quotes are piling up. Thanks to the NY-Sun Initiative, homeowners get the 25% tax credit. After factoring that out, the federal government offers a 30% tax credit. You also don’t have to pay sales tax on your purchase of the system. If you live in New York City, you enjoy a property tax abatement (PTA). It’s good for four years at 5% per year for the cost of the solar system’s installation. The PTA is applied after the NY-Sun Incentive. The abatement cannot be over $62,500 each of the four years it runs. Can I lease the system in New York? Should I buy instead? There are many advantages to leasing versus buying, depending on your solar PV system quotes. Really, everyone’s situation is different, which is why you need to talk to one of our solar installers directly. What About New York Net Metering? A great way to save money by going solar is Net Energy Metering, which involves homeowners with solar panels actually selling electricity to the utility company. If you want to participate, your home must be hooked up to the local electrical grid, and meet some other requirements that are specified by the utility provider. The surplus energy produced by the solar panels earns a credit for the homeowner, which can be applied to the utility company’s bill. 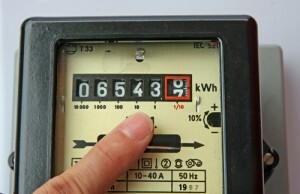 Part or even the entire electric bill can be paid for using the surplus energy credits, depending on how much energy the solar power system generates. That means that you might not owe the utility company anything, and instead you could be getting paid for using solar power. If you’re a resident of the New York State and are even a little interested in solar power, you should act now since it’s a prime time to jump in. Your investment could actually give you some real cash or a big credit with the utility company, making it even more worth your time and effort. With all of the incentives, tax credits, and other benefits from local governments, making electricity with the power of the sun is a smart idea and a great investment. Not only does installing solar panels make great sense financially, it’s also a good thing to do for the environment. The system gives off zero emissions, plus it doesn’t ruin biospheres like how building dams does. The panels just sit on your roof, out of the way and bothering nobody, where they make clean energy year after year. To find out just how much your solar power system will cost, especially with your unique situation, plus receive specific details on having a system installed for your house, click here.